Walking Fort Bragg: Break time. 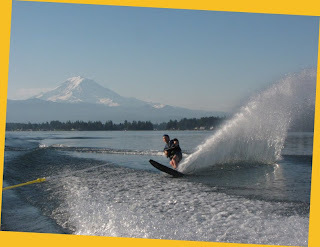 Early morning waterskiing on Lake Tapps with Mt. Rainier in the background. That's not me. That's son Jeff. I'm just the photographer! Next we are off to the Arlington EAA Fly-In. There will be a "ton" of RVs there to look at. We have our list of issues to look for concerning paint jobs. See how other builders did it. Grand Paw was getting grumpy. Boring! But not to me!